Calcutta: The Bengal Assembly on Thursday "unanimously" passed a resolution to rename West Bengal as "Bangla" in all languages. The proposal was cleared by the state cabinet last year after the Union home ministry sent back a 2016 state plan for three names - "Bengal" in English, "Bangla" in Bengali and "Bangal" in Hindi. Speaking in the House on Thursday, chief minister Mamata Banerjee said she still preferred the three names but was left with no option after the Centre rejected the idea and insisted on a single name in all languages. The new "Bangla" name will have to be cleared by the Centre. "We wish to have three names in three languages for the state. But we cannot do it as the Centre has opposed the idea. So we had to pass another resolution (with the single name)," Mamata said. Asked outside the House whether the Centre had cited any specific reason while rejecting the previous proposal - particularly when India is also known as Bharat - the chief minister said: "They do like this...We have proposed different names in different languages but they refused to accept." When the proposal for three names was tabled in the Assembly in 2016, the Opposition had walked out . "We had mentioned earlier that the state cannot have three names in three different languages. The ruling party did not hear us but they had to accept our argument after the Centre rejected its proposal. It is a loss of face for the state," CPM MLA Sujan Chakraborty said on Thursday. According to him, the Jyoti Basu government had in 1999 proposed "Bangla" . Trinamul opposed the change then and so had the Atal Bihari Vajpayee government, in which Mamata was a cabinet minister. Prior to sending the latest proposal , the Mamata government had suggested a change to "Paschimbanga" in all languages in 2011 soon after it came to power. But the state did not pursue the proposal with the then UPA-II government, in which Trinamul was a partner. Sources in the state government said the name change had been initiated in 2016 after Mamata had to wait six hours for her turn to speak at an Inter-State Council meeting in Delhi where most chief ministers were present. In the alphabetical order of state names, West Bengal comes at the bottom at No. 30. Bengal or "Bangla" will take it up to No. 4. However, the change may not guarantee an early speaking slot for the state's representatives. In recent meetings, the Centre has used the reverse alphabetic order to ensure equity. 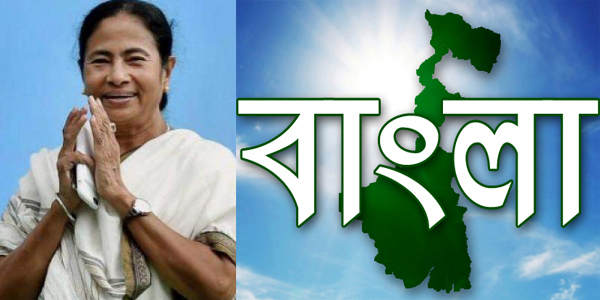 The Bengal Assembly on Thursday "unanimously" passed a resolution to rename West Bengal as "Bangla" in all languages. The proposal was cleared by the state cabinet last year after the Union home ministry sent back a 2016 state plan for three names - "Bengal" in English, "Bangla" in Bengali and "Bangal" in Hindi.